The River Vartry Protection Society fought long and hard including bringing the matter to an Oral Hearing for An Bord Pleanála. The permission was granted taking into account most our conditions and changes that Irish Water made voluntarily over the two years of process. We want the upgrade, but we do not want to endanger the River Vartry. Like Mick Jagger said, “You can’t always get what you want, But if you try sometime you find, You get what you need”. Let me just highlight the result and why we see this as a Win-Win. 1- There will only be an extraction of maximum 80 Ml per day and never more. 2- There will be a single document created with all the commitments by 14th March. 3- 5ML per day will come from the retained sand filters. We voiced our concern about the long-term viability of this and we wanted more water but the pipe will be remotely valved, and capable of 15ML/day should the future prove this is not sufficient to sustain the river. 4- Back pumping will cease. 5- All supernatants shall be recycled to the head of the works. This is a big change to the quality of the river, no nasty discharge that has been dumped for 150 years! 8- The Hazardous Chemicals storage and treatment will be decommissioned and a new one will be relocated to the new plant, far from the River. This will prevent any possible spillages and fish kills. 9- Two permanent gauging stations will be built, one at the top just after the compensatory flow and one further down. 10- Data to be made public. 11- Create a wetted area fisheries habitat mapping and hydrological monitoring to include fisheries area assessment. 12- An Environmental Management Plan and Invasive Species Management Plan will be submitted and a permanent Clerk of Works to monitor the effect on the Environment and complaints from the public. I believe the time has come to work in cooperation with Irish Water and develop a common concern for the environment. They have shown their willingness to really listen to the public and we have shown our willingness to work together for the benefit of everyone. We can balance between the abstraction and the environment. 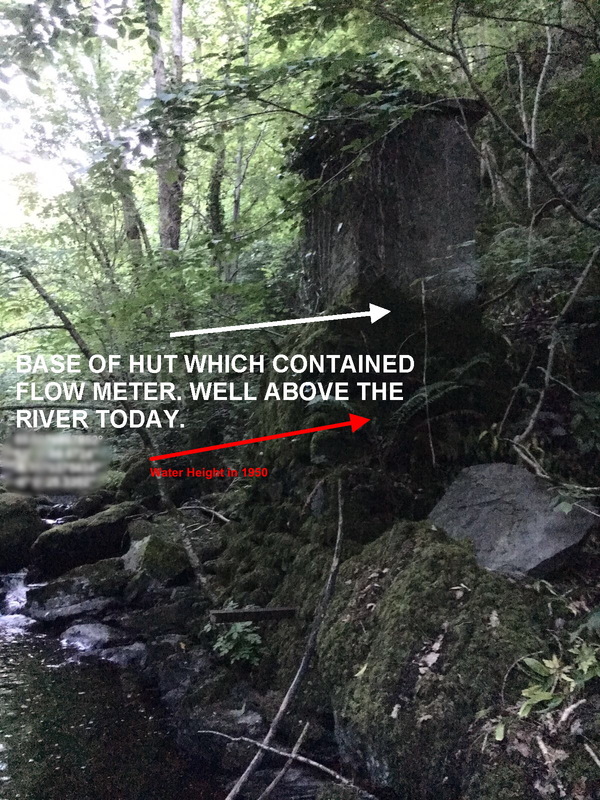 Finally, we give our grateful thanks to the Inspector and Hydrologist and to An Bord Pleanála themselves for the wisdom to find a Win-Win situation in a most difficult case. The Oral Hearing is now complete and we would like to update everyone on the process and the sense of it as there are no results or conclusion that can be drown until a decision is made by An Bord Pleanála. There are some thing promised to look at that might give you a “better picture” of it. First have a look at the film Film – Save the River Vartry. We are very satisfied with our performance over the three days, with little that we could improved upon. Alan Doyle, or solicitor gave an iron-clad argument for the absolute Legal Requirement for an EIA that was not required by the WCC. The lawyer for Irish Water did not even attempt to place counter arguments but just responded in a few words of “well I won’t waste the Inspectors and everyone’s time, that is what Mr. Doyle thinks, it is just not so.” Did he suspect, know, presume that the Inspector would never delay the building of the new Water Treatment Works by sending it back to Wicklow County Council for an EIA and a new planning process. He is probably right, as I too felt the decision was already made. The Oral Hearing might only be for our benefit to feel heard. They may accommodate some of our concerns with further Conditions as the Inspector asked for a full list and Irish Water agreed to most of the conditions but… The Inspector is not obligated to place all our conditions to the Bord, nor is An Bord Pleanála required to listen to what the Inspector recommends. They very often these days, go against the Inspectors. Before going into details, I have to say that EVERYONE behaved very kindly and friendly with little or almost no Adversarial Behaviour. There was a bit of it when Irish Water were trying destroy Inland Fisheries Ireland director Brian Beckett. It probably should have been stopped, and I was intending to point it out later, the impoliteness of it all, but people were too tired after three days. Even Irish Water’s Barrister had absorbed that this was a friendly atmosphere and that kind of cross-examination vs discussion was for the courts. Brian is one of the most knowledgeable persons of great integrity, and of absolute devotion to the Fish and the Rivers. We should all appreciate how fortunate we are to have him and his team looking after our Rivers. There are several subject Headings for those who would like some detail. The process of the Oral Hearing was flawed by the fact that at the hearing Irish Water gave us new material that was never part of the Planning Process and should have been. At 17:30 on Monday in 5 minutes, I found out what putting the discharge into the “head of the works” (which is all that was said in granting planning permission) really meant in a verbal explanation. I needed then to study up until 3:00 am to return at 9:00 am and produce my counter argument. This information will not reach the public and will never be seen by you and others who deserve to see this in proper sustainable planning. This was only one of the many new things like the methid how Irish Water are going to give us the limited 5ML/day “Compensatory Flow”. Something so fundamental should be part of the planning process and available for 6 weeks for you to comment on. This objection that we made at the Oral Hearing was noted. Even such bad practice on behalf of the Planning Office and Irish Water, will not send this back to WCC. The legal case for and EIA is sound and unshakeable. If someone is interested, write a comment and we will send it to you. That too is likely to be ignored. Irish Water says 5ML/day was good since 1865 and the river was good, so we are going back to that! This was picked arbitrarily and then on Monday backed up with Science done to prove that the arbitrary figure is correct. All of the data we have on flows is from 1950-1978 or mid-last century! There are “spot flows” taken a few days without having rain data or the raw data supplied. Any flow is nonsense without know if it rained two days before because the river can swell 5-7 inches from two nights of moderate rain. To illustrate the nonsense of this, I presented the picture of the place where the flow data was collected 70 years ago. The little shed is now 3 meters away horizontally and 3 meters vertically from water. What is more evident is that Irish Water’s claim all is the same as it was for the last 150 years. Can you imagine what that gorge looked like in 1950 for water coming up to the red arrow on the picture above. But unfortunately I think our argument for more water fell on deaf ears and will not be taken up. What we know absolutely is that the 5ML/day is 1/4 of what we are getting now, being leaks or not. Brian Beckett and the IFI made the point that at Ashford and Newrath the fish quality went from GODD to HIGH in the last 2 years, parallel to us having more water. Irish Water wanted to destroy this argument completely, therefore the attack on him. Their attack was three pronged. First they said the increase was based on the decommission of the Ashford Treatment Work. We countered with the fact that surely it had some bearing but not of the increase in Ashford since that is above where the treatment works is! The second attack was that the EPA lists the status to GOOD still. IFI explained that this was in discussion, they had not updated their numbers and that they take the lowest value overall. The third point was that the status was GOOD before 2007 when the leaks started. IFI explained that the WFD only started then and there were not the statuses at that time. They were pressured to say that probably the status if compared would perhaps be equivalent to GOOD and Irish Water took that as a confirmation that the status has not changed, against our national experts on Fish. I promised to put up the photos and video of the spawn. The fish are so resilient that in early November when we had two weeks light rain, there was enough water and the Salmon at sea knew that it would be the only opportunity and rushed up river for the spawn. Here is a video taken of just that and two more of the care and kindness of the Vartry Conservation and Angler’s Club shown to the fish as they only take sea trout on a catch and release program. The day has almost arrived and we hope all of you will be there to help support our final drive to get Irish Water to do right by the Environment. It is a David vs Goliath, River Vartry Protection Society vs Irish Water kind of event. We have great stones in our little pouch that can kill a giant, but it depends on skills on the day. Are we scared? Sure! When you face an ugly giant like Irish Water, you have reason to be afraid, but sometime right wins over wrong. They spent hundreds of thousands of euro to hire the best consultants and lawyers to defend against us, but had they used this money to educate people about saving water instead, they would have the water they refuse the River Vartry. The Draft River Basin Management Plan is now published and is a comprehensive view of Environmental Issues. This is a different approach as in the past. This is now just an overview of how Ireland intends to protect the Environment in accordance with EU Directives. This should be the most important overall document in Ireland dealing with Rivers, Water and all aspects of the Environment and how it affects these resources. This time the Plan has been divided into two parts, the first is an overview and has “no Teeth”, although being a good summary of what needs looking at. The Second part, not yet written, is the individual Basin Plans which should protect us. This part is up to us to make the Department of the Environment aware of our concerns and see that the River Vartry is cared for properly. Remember, numbers count so see that your voice is heard. We have been allowed to present our case in an Oral Hearing. The time and place has not yet been decided but we will post it as soon as we have it. This was granted because of the significant national or local interest. Everyone is invited although space can be limited. We ask you to be present on the day as this illustrates your commitment to the Protection of the River Vartry. Our small river is a “Champion” and shows its diversity in surviving and thriving against strong adversity. We will hopefully be allowed to show some “Never before seen” footage of the river in Spawn this year. We have been careful about showing this, because we feared Irish Water would turn this against us and say, see the River thrives. Now it is the time to show that nature is miraculous and gives us ample time to correct our ways. Where we would have floods, we had drought this year and have even now though the whole winter still have the same dangerously low water condition. Yet in the only two weeks when the water rose 6-8 inches, the Salmon knew and were waiting even thought it was very early for the Spawn. They knew it would be there only opportunity and we have even had Salmon experts say “You must be mistaken, that is not possible”. Well, I won’t spoil it for you. Come to the meeting and see for yourself. Our beautiful, historic, brave little river still survives. It shouldn’t have to fight and 100 years from now, people will come and marvel at the River that defied all odds. Irish Water admits to delivering to the River Vartry Lime though a maintenance blunder killing 100s of fish in the first 500 meters of the River. How this will affect the eggs deposited by the spawn in November is unknown. The event happened because a belt broke on a machine that creates a lime sludge used in lowering the PH of the water delivered to Dublin. This flooded the yard with a drain that went directly into the river. Rather than admit or alert people to the spill, or seek immediate advice from the Irish Fisheries, the employees were sent with brushes into the river to brush the signs of the spill from the bottom of the channel. This moved the spill but without flushing with more water, only succeed to pollute further down the channel. It is this lack of care, knowledge, responsibility, integrity and safety controls that have lead us to question everything that Irish Water has to say. They are trying to use this spill, yet again, as mis-information to further their aims. They say, “see the plant is old and needs replacement”. What they do not say is that this part of the treatment works will be maintained in the new configuration and no planning has been sought for a new store of dangerous chemicals or lime sludge system. What we want is NEW controls, NEW Systems, with safety procedures and the impossibility of this happening again. It means proper huge tanks to hold such spills. No drains that lead to the river. Procedures to carefully empty these tanks and move the poisons off-site without the possibility of reaching the river. We don’t want assurances, we want penalties, we want greater flows given to the river to dilute such instances, we want the ability to divert clean water directly from the treatment works in catastrophic disasters such as this. What we don’t want is lies, deceit, and coverups. What we don’t want is PR that says “We are not abstracting more water”, “we will give the river the same as it has been for the past 150 years”. Then in another breath they say “it is the same as in pre-2008. We have been leaking since then and this leak is 10 Million Litre per day”, when their own charts say up it is up to 15 ML per day. We don’t want them ignoring the fact that the period of leaks coincides exactly with the period that the fish have gone from poor to excellent health (the only river in Ireland) and the water quality from poor to good. Do not be fooled by the PR of Irish Water which is an expense that they can afford and pay for. They know what they are doing and that they are intentionally ignoring our concerns for the River Vartry. It is not that they do not believe what we say, they are fully aware of the risks, they only do not want to deal with them because it will delay them and COST MONEY. To them Water has a value and is their commodity that can be sold. Giving it to the river is letting money flow down the drain. They are a profit based company and they will not do that unless forced to do so. Protecting the Environment cost money and they see no reason to pay for it. It is someone else’s problem. We need to make sure that they are “encouraged” to think differently about this. Delays will cost them more and they will be delayed if they do not listen to the voice of the River. It is important for us to understand the full inadequacies of the process of Granting permission to Irish Water for the New Roundwood Treatment Works. To do this we have launched a Freedom of Information request for all the details surrounding the Jonathan Sexton report. This should provide some interesting reading. It will be at least 4 weeks until we hear back, especially with the Holiday break of 9 days. When (if) we are given the opportunity for an oral hearing, this material will be provided to An Bord Pleanála. With our Appeal going in on Monday to An Bord Pleanála, we have made the best effort possible to save the River Vartry on behalf of all of you who could see that this was the big battle. Until our Appeal is accepted and we have the file number from An Bord Pleanála, we cannot publish our Appeal but we can give you a few snippets, should you be in any doubt of why we are fighting. 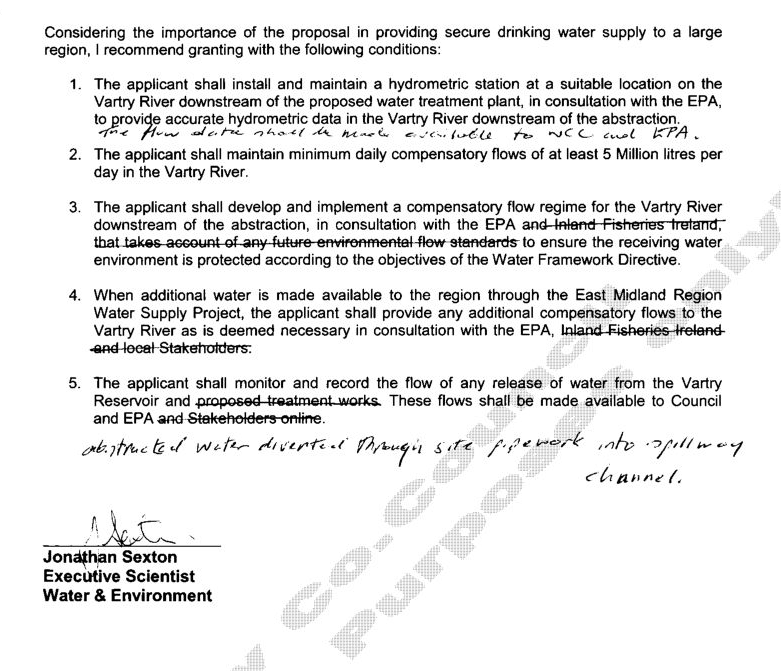 In order to make a determination of Environmental Impacts, Wicklow County Council needed to apply “Best Science Available Principle” and for this they asked Jonathan Sexton Executive Scientist – Water and Environment who works for the Wicklow County Council. We can only applaud Jonathan Sexton for his sound and well founded suggested condition on the planning. We of course, suggested this approach but he recognised that this was the approach to be taken. Unfortunately “someone” did not agree and put pressure on him to remove this because on the version of the 11/11/2016 it was removed. 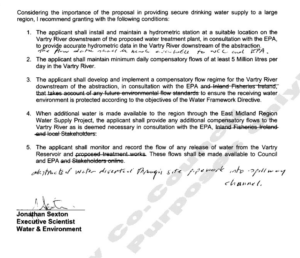 What was added was the statement of Jonathan Sexton “Considering the importance of the proposal in providing secure drinking water supply to a large region, I recommend…”. Clearly he was not fully in agreement with this decision and but complied to the pressure placed upon him. Below is the full text of his recommendation. Had this been the only issue with this report, it might pass the scrutiny of An Bord Pleanála as without proof that undo influence was placed by Wicklow County Council on an Independent Science Report. However… If you look below you will see that in the public record is a Science Report that has been altered by an “Unknown Hand“ after being published by Jonathan Sexton. This is sloppy and an unacceptable action by a Planning Authority and we claim makes the whole process in doubt. Were it to happen to you or me on planning for our new house, someone would scream. We are screaming that the Planning Permission is Null and Voided by the hacked Science Report and Wicklow County Council cannot be trusted to perform an unbiased Planning Process on this file. When you look whom has been crossed out by the “Unknown Hand“, it is Inland Fisheries Ireland and ourselves the Local Stakeholders. Is it not surprising that these are the parties that have strongly opposed what is happening and have questioned the wisdom of the Wicklow County Council going ahead without a proper Independent Environmental Impact Assessment. This illustrates their bias against anyone who opposes themselves and Irish Water. This is not a transparent or adequate process. Read it for yourself and raise this issue as loud and vocal as you can. We need to prove to An Bord Pleanála that it is not just us, but all of the public that want this decision reversed and sent back for proper analysis. Only this will insure the survival of the River Vartry. We had a very successful meeting on Friday the 9th of December and were joined in the Ashford Community Centre by 84 people with apologies from another 27 that could not make it. Everyone was actively supporting and we raised €2200 to help with our expenses for the fight at An Bord Pleanála. The approach was agreed and we are meeting with the Barrister to produce the final Appeal and request for an Oral Hearing. The total campaign has raised €3450 euro which has been used for the Barrister and two Ecology consultants in preparing the Appeal. We had the privilege of having 3 Councillors from Wicklow, Jennifer Whitmore, John Snell, and Steven Matthews who’s clarity and contribution was very much appreciated. They too were very concerned about the performance of the Wicklow County Council in granting permission to Irish Water at this time without an Independent Environmental Impact Assessment. We reiterated that we feel that the Treatment Works needs upgrading but that this can be done without damage to the River Vartry. This is where we differ with Irish Water. To get to this position it requires the technical knowledge and the study of the river and what changes it can absorb and tolerate. This process was not done and the Wicklow County Council granted permission prematurely before anything was completed. 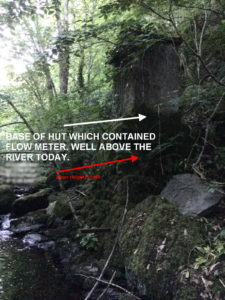 This leaves the River in an unprotect position within Irish Water’s control without conditions. We will be finalising our Appeal with the Barrister this week and asking for an Oral Hearing. One of the grounds for this is of great national, regional or local concern. For this we need your help. Make your voice heard. Contact me Matthew at Rivervartry.com or go to our Crowd Funding page, https://chuffed.org/project/save-the-river-vartry-from-irish-water. Share this via facebook or twitter and the word will get out.